About two years ago, I was doing my usual shift in Boots when I stumbled across a couple of interesting looking items on the New Beauty Finds stand. I returned in my own time to investigate these cute looking boxes and so began my obsession with MoYou London nail stamping plates. This company, in my opinion, just get it so right. They don’t just make generic stamping plates to be covered in nail lacquer, they make genuinely beautiful works of art. Each plate comes in its own sleeve which is beautifully decorated and just makes the product feel so special. I also love the themes they use for their plates; there’s literally something to suit everyone’s tastes and interests. Here I’m going to show you a basic guide on how to nail stamp, as well as some of my favourite plates from MoYou London. I’ve gotten a bit more creative with this post and have actually filmed a short clip to demonstrate the basic technique of stamping. I’m certainly no pro at it and I usually have a lot to clean up when I’ve finished my manicure, but if you want to see more on nail stamping then check it out on YouTube. These are my favourite plates that I own from MoYou. The Mandala and Arabesque collections are so beautiful. All of their collections are beautiful to be honest. I’ve taken some closer images of a couple of the plates to show you what features on them. I would highly recommend perusing their website though because it’s just so addictive. The Literature plate in 01 is a particular favourite of mine as it is Pride and Prejudice themed!! I’ve taken a closer picture of this one (see below) because it is just so beautiful and includes so many quotes from Jane Austen’s novel. – (Optional) a bottle of MoYou’s Cuticle Guard which is basically liquid latex. I like using this because it means there is less to clean up around my cuticles. – A MoYou nail lacquer in the colour of your choice for stamping the design. To create this particular look, I’ve used a combination of Silver Fox, Peacock Blue and White Knight. So start off by laying out everything you’ll need. Then apply your base coat; the Butter London one is good as it fills in any uneven ridges I may have and also makes it really obvious when it’s dry becusse it turns matte. Then apply the liquid latex around the cuticle area of all of your nails and wait for it to dry. Once it’s dry it will turn from a baby pink colour to just a clear shiny looking substance. You can give it a gentle touch if you like, as long as it’s tacky it’s good to go. Then apply the nail colours you want as a base colour to the design. I went with White Knight on all my nails except my ring fingers on each hand; on those I used Silver Fox, but you could use absolutely any colour/any brand of polish for the base. It’s important that the stamping colour you use is of good quality though (that’s why I mainly like to use MoYou’s stamping nail lacquers) because the colour pay off has to be strong enough to translate the stamped design on the nail. I’ve tried a few of my normal polishes before and they haven’t transferred onto the nail very clearly. Once your base colours have dried then it’s time for the stamping. I’m using the Arabesque stamping plate in 01 for this look. The basic rule of thumb for stamping is to be as quick as possible to pick up the image onto the stamp because the polish can dry on the plate and then you won’t be able to lift it. So cover the image of your choice in polish, then scrape at an angle, then roll the stamp across the image to pick it up from the plate. Then you just roll it nice and gently over your nail, simple! It takes a few tries I will admit, but once you’ve got the hang of it you’ll never think it’s hard. 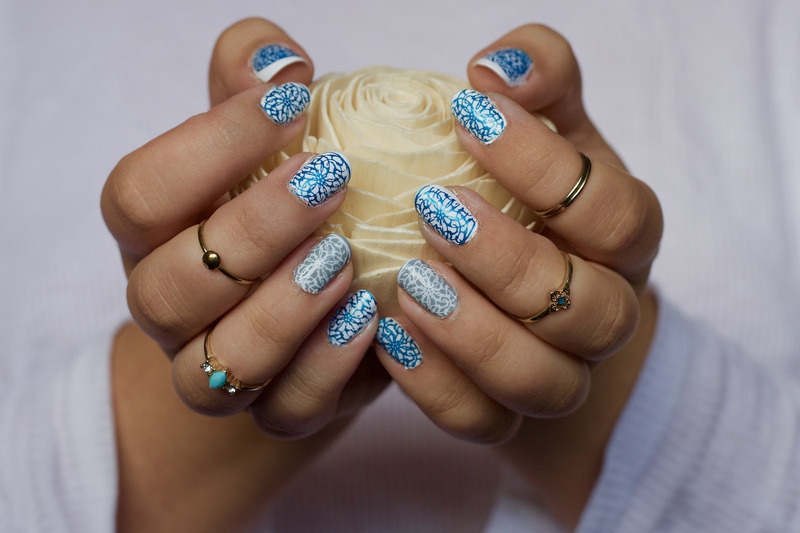 When you’ve done a nail I would recommend cleaning the stamper off with either polish remover or a bit of sellotape which will lift any remaining designs right off. Use a cotton pad and polish remover to clean the scraper and you can also use the cotton pad and remover to clean up your stamping plate too. I don’t always do this after every nail, but it’s good practice to because the cleaner the plate, the clearer the stamp will be. If you let it build up with lacquer you’ll end up only getting bits of the design on your nail. To get my morrocan themed look, I stamped all of the nails except my ring fingers with the peacock blue colour. Then over the grey ring fingers I used the White polish to make them stand out. Here’s a video demonstrating the method for stamping, because I know it all probably sounds quite confusing. So once you’ve got all the nails on one hand stamped, you lift away the liquid latex with tweezers which should clean up most of the mess. If all else fails, use polish remover and a cotton bud/cotton pad to get the rest off. Apply topcoat to all of your nails and let it dry for a minute (if you’re using Seche Vite it’ll be dry within 30 seconds). That’s it! Once I fully got the hang of this, I could do a manicure in no more than about 30-40 minutes so persevere folks! I went all out with this one because I felt like it’d be way better to show you what I mean so it made as much sense as possible. I hope you enjoyed it, it took a long time but I had so much fun doing this post! Thank you so much for all the support to all my lovely readers! Let me know if you want more nail stamping posts too!